A survival knife isn’t just a knife. It’s one of the most important tools to have on you. Whether you are in back country or packing up your bug out bag  – you need a dependable knife. 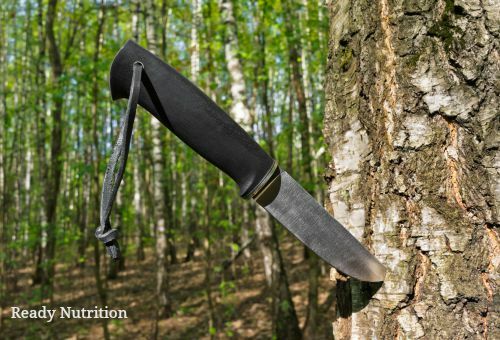 A good knife can cut down branches to make a survival shelter , make traps  or skin animals. It can also be used for cooking and defense, if need be. That said, not all knives are the same and understanding this before investing in a knife will help you make the most of your investment. The steel used in making knives is also a fundamental characteristic of a good blade. Many of the better-made knives use a combination of alloy (i.e. a mix) of carbon and iron, and other elements such as chromium, molybdenum, nickel, and vanadium to improve the strength and durability of the knife. Here is a chart of the different types of steels  for you to turn to. Synthetic Materials – Composite materials like carbon fiber, G10, and ZYTEL® are synthetic materials that make good knife handles. Many of these synthetic materials unbreakable and resists impact and abrasions. This article  details the many synthetic materials that can be used for knife handles. As well, and perhaps this could be considered a fourth characteristic to consider is the skill of the handler. Always keep in mind that knives are sharp tools that can do just as much damage to tissue than to wood or other materials. If you are in a bushcraft environment, you will be away from doctors, so maintain a level of safety when using a knife. As well, learn about the proper knife grasps  to maintain the most control of the blade. Moreover, to ensure a long-lasting knife, it occasionally needs to have a little TLC and be sharpened regularly and periodically oiled.